The best method of understanding and appreciating the Shapes and Form School is to look at burial sites of many ancient Chinese Emperors. While settlements which had mostly disappeared, most of these ancient tombs are still intact and visible for all of us to see, today. The best examples of Feng Shui are the Ming Dynasty tombs which were built at the foot of hills. These excellent sites have good Feng Shui and are the tombs of famous late Emperors. These sites, partially because of their excellent locations have now become extremely popular tourist spots with excellent scenic views. 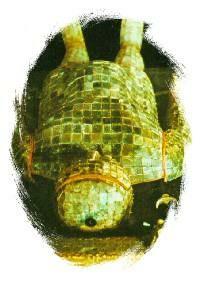 Picture above: A Chinese emperor clothed in a full Jade suite stitched together with gold threads.